pampering experience you truly deserve! them by sending them this spa set today! - The bath salt, body scrub, and bath puff exfoliate the skin gently. - Lavender-scented shower gel and bubble bath invigorate your mind. - Contains hydrating and moisturizing ingredients good for your skin. - Gets you all set up for a pampering time at the comfort of your own home. - Comes in a gorgeous packaging that makes it an excellent gift item. Indulge in a soothing and tranquil spa experience that this lavender bath and spa set offers. Click 'Add to Cart' now! INSTANT HOME SPA: Why spend several dollars at the spa, when you can get things done right at the comfort of your own home? This lavender bath set comes with a 240ml shower gel, 240ml bubble bath, 50ml body scrub, 100g bath salts, (4) 15-gram bath bombs, & a rose-shaped exfoliating bath puff. TIME TO UNWIND: Before you hit the sack, why not treat yourself with the soothing aroma that lavender offers? This lovely herb is naturally comforting to the senses, so you can rest your weary mind and body as you pamper yourself with this Lavender bath and shower set. NATURALLY FRAGRANT: Made from high-quality ingredients, this shower bath set is an excellent skin food that your body will love. It also captures the natural scent of lavender, so you can get a whiff of this calming fragrance to balance your mood and nourish your skin. This shower set is one of the best gift ideas for her you will find. EXFOLIATE AND MOISTURIZE: Your skin deserves plenty of TLC, and this bath bomb gift set has everything it needs to stay smooth, fragrant, and glowing. A package contains bath salt, shower gel, and lotion to keep your skin soft to the touch all the time. 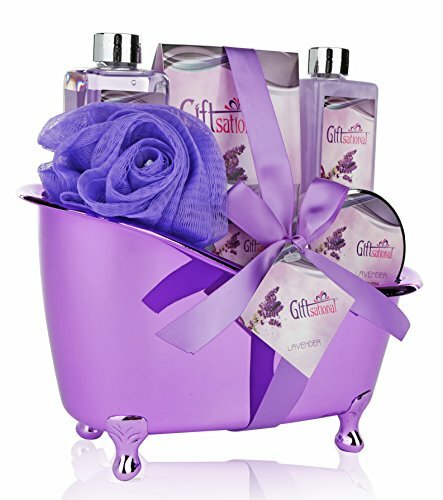 GREAT GIFT FOR ALL OCCASIONS: Be it your girlfriend,wife, mom, grandma, daughter, colleague, friend, or neighbor, this bubble bath gift set is one of the best spa bath gift baskets to give them as a Holiday gift, Christmas gift, Valentines Day gift, birthday gift, housewarming gift, baby shower gift, bridal shower gift or anniversary gift for her, as it comes in a beautiful purple tub packaging and also makes a memorable thank you or congrats gift basket for women. Click 'Add to Cart' now! If you have any questions about this product by Giftsational, contact us by completing and submitting the form below. If you are looking for a specif part number, please include it with your message.